Stefan von Licht; Hugo Helbing, Frankfurt, 7 December 1927, lot 310 (unsold). Stefan von Licht; Vienna, Dorotheum, 9 December 1932, lot 537 (to Artaria). Artaria; Vienna, Dorotheum, 7 April 1933, lot 216. Kurt Meissner (his mark, not in Lugt). The British Rail Pension Fund; Sotheby's New York, 8 January 1991, lot 120. A.P. de Mirimonde, 'Les Cabinets de Musique', Jaarboek van het Koninklijk Museum voor Schone Kunsten te Antwerpen, 1966, pp. 161-2, fig. 15. W. Schulz, Cornelis Saftleven 1607-1681. Leben und Werke, Mit einem kritischen Katalog der Gemälde und Zeichnungen, Berlin and New York, 1978, pp. 63, no. 149. Bremen, Kunsthalle, Handzeichnungen alter Meister aus Schweizer Privatbesitz, 1967-68, no. 149. University of California at Stanford, Stanford, California, Old Master Drawings from The Collection of Kurt Meissner, 1969-70, no. 63. Norwich, Castle Museum, The Northern Eye: Drawings from France and the Netherlands 1600-1800, February-March 1987, no. 22. Saftleven favoured the depiction of single figures drawn on large sheets of paper and often shown seated. 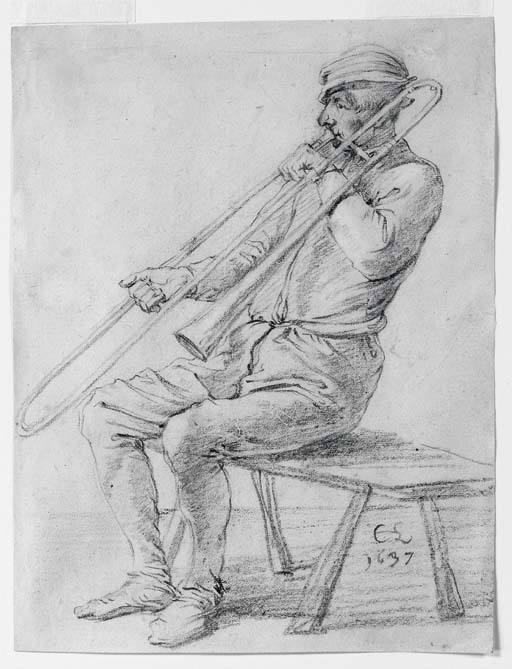 Executed thirty years after the present one, a drawing of a man blowing a trumpet in profile to the right, dated 1665, displays a consistency of technique in the artist oeuvre over the years. An entire gallery of portraits was thus created, many of which are now in public collections such as the Fondation Custodia, in Berlin and Darmstadt, W. Schulz, op. cit, nos. 58-73.